a little gray: Sparkle Baby Quilt Done! I LOVE this quilt. It might be my favorite yet. I made it for a family member, but it is going to be hard to give it up. But at the same time I'm really excited to give it to them. I finally got to use my swapped and hoarded Echino (well, just 4 out of 28 squares, but still) and I think the sparkle block is perfect for them. I really wanted them to stand out, so I only made three of the blocks and then framed them in this fantastic black yarn-dyed Essex linen from Fresh Modern Fabric. I need a LOT more of this stuff. It's a little hard to tell, but the quilting lines switch directions a lot and go all over the place. There are places where I was quilting in angles that were less than 45 degrees, which was not easy. But after washing it everything worked itself out. 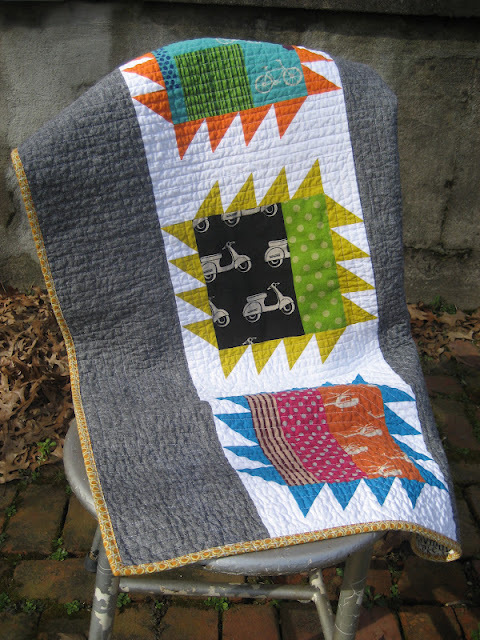 I left the scooter square un-quilted because I'm going to add some hand stitching there with perle cotton. Can you believe I've never tried it before? I'm hoping it doesn't get too distracting from the design. If it does, I guess I can just cut it out. The back is Loulouthi hugs and kisses in gold (which is also the binding) as well as a Michael Miller word search print and another text print from Ikea, and a little more Echino. The quilt ended up about 40" by 45." Thanks for the fun QAL Jeni and Megan! Love your version of the Sparkle QAL! Very very pretty! Gorgeous! I love that scooter fabric. I have a quarter of it somewhere that I'm saving for something fun. oooo! I love this, perfect perfect with just the three blocks!!!! this is really cute! Your quilting is so great-- you must have a lot of patience! such a great job! I'm so impressed by this! I can't imagine myself being able to quilt in a million years. This is so pretty! I love the idea of showcasing the three blocks. They really pop! this quilt is off the hook! I love it! oh yeah - love your version too!! Your quilting just makes it - so cool!! Amazing! 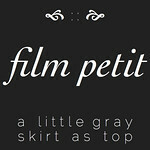 I love the gray you used, looks wonderful! Oh my goodness, your Sparkle is amazing. I love the Echino, I love the gray, I love the quilting. wow! i love it! that quilting is awesome sauce. i love this! 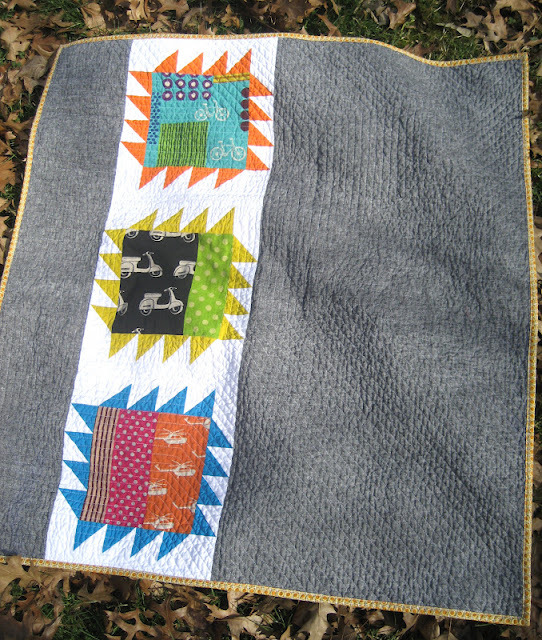 so modern with the three blocks and the quilting is spectacular! i am going to pin the crap out of this! i love this , its the perfect quilt for those fabrics, and i really want to get some of that yarn dyed linen! LOVE!! It's just perfect, Jessica. Ya did good. Beautiful!!! 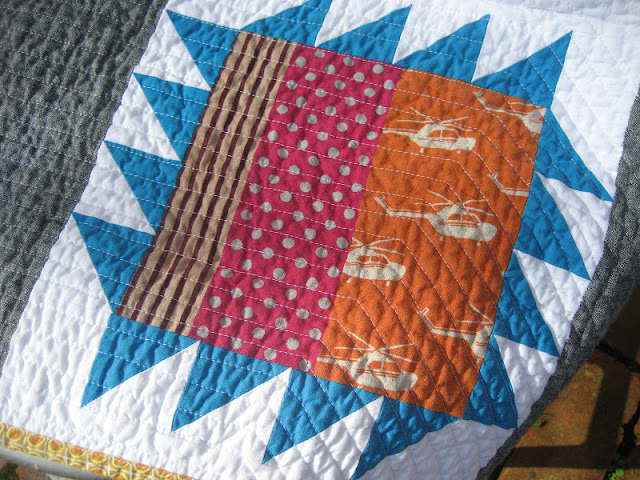 Your quilting is absolutely gorgeous! What a wonderful quilt! I've been saving my echino fabric for something spectacular. I think this is it! That quilting is amazing...jaw-dropping, amazing! I love your take on this. Absolutely gorgeous! is there a tutorial or a pattern for this quilt?? I want to make it! I just made my first quilt, inspired by yours and using the Sparkle QAL. One day I'd like to try something like your Japanese print one - it is also gorgeous, but a bit beyond me at the moment! Thanks so much! !